A warm welcome back to regular readers of “Between Minds: An Ongoing Taxonomy of Team Dynamics.” For several weeks now we’ve been identifying the dueling dualities who populate your office space and project teams. Our previous entry, Optimists vs. Pessimists, detailed both the critical distinctions between the glass-is-half-full and glass-is-half-empty crowds and the one surprising similarity (both were indifferent if the beverage in question had gone flat). 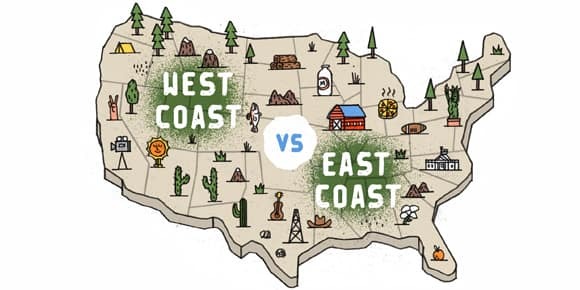 This week, we direct our attention to the most divisive dichotomy of them all: East Coast vs. West Coast. This coastal rivalry is far more than just Atlantic vs. Pacific. It’s Celtics vs. Lakers, Broadway vs. Hollywood. Biggie vs. Pac. And there’s no straddling the continental divide. You either face west towards the sunset or east towards the sunrise. The roots of the coastal conflict trace back to America’s expansion westward during the 19th and early 20th centuries. The early settlers of the frontier were moving away, literally and figuratively, from the traditions of the East coast establishment and the politics of Washington. As a result, two divergent but complementary business sectors developed. The East coast retained its financial and manufacturing leadership, but the West coast was the premier destination for investors seeking their fortunes. Gold prospecting gave way to the oil industry, the timber industry, and agriculture. An influx of talented, Eastern-educated businessmen and cheap immigrant laborers from Eastern Europe and China helped spur early growth. The divide truly began in 1849, when 80,000 Gold Rushers migrated to California carrying (legend has it) lattes, surfboards, oversized sunglasses and all of the accoutrements of the West Coast lifestyle. The West’s laid back business culture may seem rooted in relaxation, but it’s actually an extension of the rugged individualism of the frontier. The grizzled prospectors have become Silicon Valley venture capitalists. Indeed, the gold rush has continued unabated as entrepreneurs and developers keep searching for the the next “big idea” that could make them a fortune. The unwashed Levi’s and untucked shirts may suggest a lack of professionalism, but this carefree couture masks an extremely motivated, maverick business community more interested in success than tradition. Still, big ideas are nothing without capacity for commercialization, and that is where the Atlantic looms large. Much of America’s business engine still runs through the Northeast corridor, and some of the most important industries of the 21st century are located within a 300-mile radius of Manhattan. These include media and communications companies (Time Warner, Comcast, AT&T, and Verizon), financial giants (JPMorgan Chase & Co., Citigroup Inc., Visa, Mastercard), manufacturing behemoths (GE, DuPont, Lockheed Martin), and the single largest organization in the world—the U.S. federal government. It may seem like a cliché, but anyone who has worked on both coasts will attest that there really is a significant difference in lifestyles, business practices, and fashion accessories (Burberry scarves vs. unsullied North Face gear). When business leaders from San Francisco or Seattle fly east to meet investors and establish contacts, they find a far more aggressive business environment than they are accustomed to. East coasters are loud and opinionated and not afraid to tell you what they think. West coasters are diplomatic and conciliatory, seeking solutions, not confrontations. And while there are clear differences between the culture and business atmospheres of Los Angeles and Portland, or Boston and Atlanta, those two coastal pairings have more similarities with each other (especially demographically) than with their cross-country counterparts. Still, East and West remain complementary competitors. Savvy entrepreneurs recognize this and seek investment and logistical support from both sides. Even the new Internet leaders are adopting a bi-coastal strategy—Facebook, Twitter, and Google all have offices in New York City. Manufacturing companies, in turn, are moving West to take advantage of green and aerospace linkages. And thriving economic hubs in the heartland—particularly Oklahoma City and Dallas—are competing with both coasts while developing an organic business culture and environment. Have you lived and worked on both coasts? Which one did you prefer? Do you think the differences are real or exaggerated? Please let us know in the comments section.